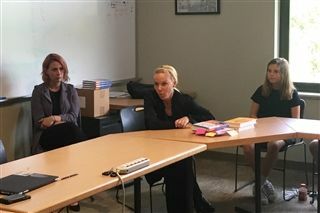 "Sometimes your path is different than what you'd assume," CEO of Evofem Biosciences and WomanCare Global Saundra Pelletier told a group of students on April 24. Feminists United hosted Ms. Pelletier to learn more about her experiences in bioscience, especially as a female leader. She discussed her role in business and shared anecdotes from her 20+ year career. An informal Q & A followed.